This week, the Centers for Medicare and Medicaid Services(www.cms.gov) (CMS) unveiled its final rule(www.ofr.gov) on the 2011 Medicare physician fee schedule(www.cms.gov). An initial review shows positive news with respect to the primary care bonus that is effective in 2011. 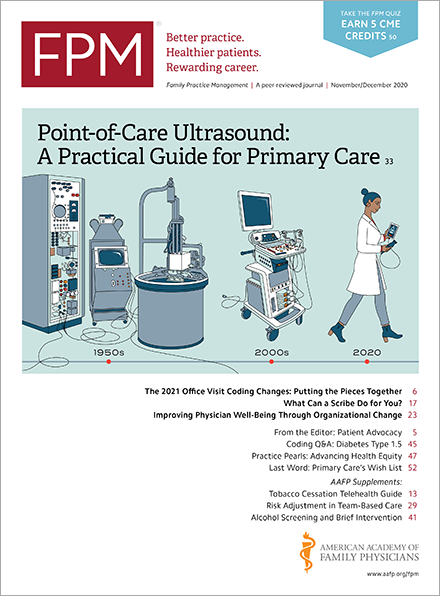 CMS apparently responded positively to comments from the American Academy of Family Physicians and others to change the primary care incentive payment implementation rules to make it more inclusive. As a result, CMS estimates that, under the new, less restrictive rules, about 80 percent of family physicians will qualify for the bonus. On the downside, the final rule with comment period announces a reduction to payment rates for physicians' services in 2011 under the sustainable growth rate(www.cms.gov) (SGR) formula. The Medicare physician fee schedule rates are currently scheduled to be reduced under the SGR system on Dec. 1, 2010, and then again on Jan. 1, 2011 under current law. The total reduction in rates between November and January under the SGR system will be 24.9 percent. That means the conversion factor will drop from its current $36.8729 to $25.5217 in January, unless Congress and the President intervene. Of course, this week's Congressional election results may impact what happens in this regard, so stay tuned. The final rule will appear in the Federal Register(www.gpoaccess.gov) on Nov. 29, 2010, and CMS will accept comments on certain aspects of it until Jan. 2, 2011.